Yes, Reese Witherspoon feels the same way you do about Nicole Kidman's performance in "Big Little Lies"
We’re still on the edges of our seats after that Big Little Lies finale, and waiting patiently to see if a Season 2 will, in fact, come to fruition. 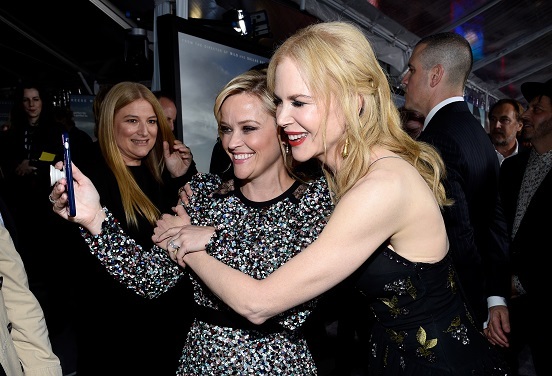 But in the meantime, we’re tending to the heart eyes we have over the IRL friendship between Reese Witherspoon and Nicole Kidman. Speaking to Net-A-Porter’s The Edit magazine, Witherspoon verbalized what’s on all our minds after watching Kidman’s heart-wrenching turn as Celeste in the hit HBO series. "My God, can somebody just give this woman an Emmy? I mean, please," Reese said. Sure, it’s a short quote, but really, does anything else need to be said? Episode after episode, Kidman’s cringe-inducing performance as a housewife in an abusive relationship had us forgetting where we were and transporting us into the home of Perry and Celeste Wright. From her efforts to fight back to her indecision about what to do to keep her sons (and herself) safe, to keeping everything a secret even from her closest friends, the layers Kidman created with the character have us writing letters to the Emmy powers that be this very minute. Plus, both Reese Witherspoon and Nicole Kidman have taken home multiple acting awards in the past — including Oscars! — so we think they probably know what they’re talking about when it comes to performance accolades. "It was beautiful. Reese and I were sort of crying and hugging and couldn't believe [it was over]," she said following the show's wrap party. "We'd been working together for the last five and a half months." Just in case Reese Witherspoon and Nicole Kidman’s words aren’t enough, here are some pictures of the twosome that have us setting all the #BFFGoals. Real friends take selfies and laugh at inside jokes together (we need to know what was so funny!). They even interviewed each other for Good Morning America, guys! All the women in this amazing, popcorn-worthy show — Kidman, Witherspoon, and their flawless castmates Laura Dern, Shailene Woodley, and Zoe Kravitz — are the reason we tuned in for its entirety and are begging for more. Are you listening, HBO?